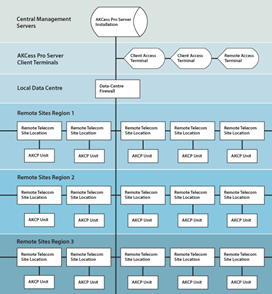 AKCP allow you to start with a basic package to enable monitoring and access control over a single site. Expand to 100,000 cabinets, one at a time. Each computer cabinet can be monitored using AKCess Pro Server. AKCess Pro Server automatically recognizes locks, cameras, sensors, and access control hardware. It’s instantly compatible with thousands of third party IP cameras. The AKCess Pro server allows you to send a range of notifications based on lock or sensor events, including recorded video events sent via email or an MMS. AKCP makes it easy to add a wide range of sensors and automate corrective action, apply software updates and distribute notifications to all of your remote sites. Create schedules that power off lights and equipment in unoccupied sites, enable or disable an engineer’s access, reboot unresponsive equipment and even unlock sites remotely. The AKCess Pro Server monitors all of your remote sites over any number of regions or locations. For cabinets located in remote locations AKCP design and manufacture complete, off-grid system solutions that allow you to monitor remote sites using a cellular network. Access database and logs stored remotely on each control unit. AKCP’s access control hardware does not need a connection to the central server to authenticate user access to each site after having been configured. AKCP’s Access Control system can also administer remote site engineer access. Card numbers can be collected and sent back to the central server for administration in real time. Access Permissions can be added, amended or revoked at any time. Updates to Access Permissions are distributed to all cabinets locations from the server. No additional maintenance teams are required.